Palo Duro Canyon is the second largest canyon in the US and is managed by the State of Texas, Parks and Wildlife Department. 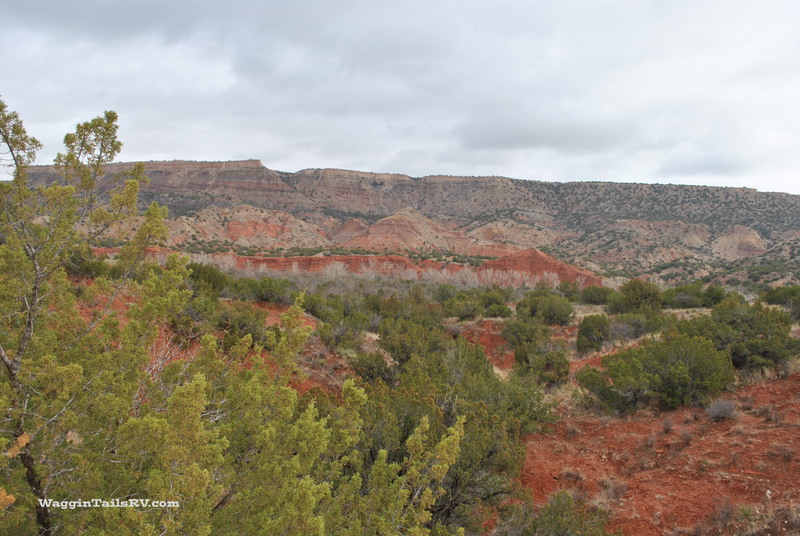 The Texas State Historical Association describes Palo Duro Canyon as “the most spectacular and scenic landscape feature” in the Texas Panhandle. 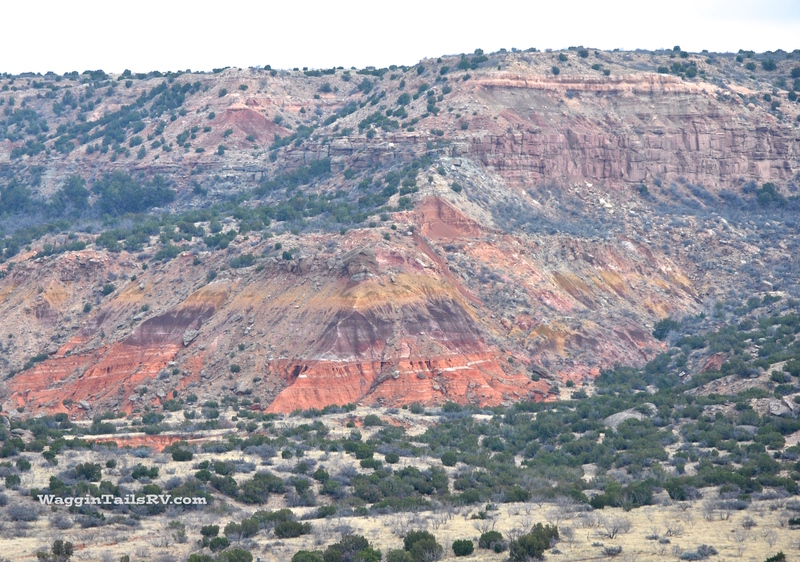 Many people call Palo Duro “the Grand Canyon of Texas”. I am not sure if that is a good moniker since the Grand Canyon is much larger. As an example, Palo Duro Canyon is roughly 70 mi (110 km) long, has an average width of 6 mi (9.7 km), and attains a depth of 820 ft (250 m), compared to the Grand Canyon which is 277 miles (446 km) long, up to 18 miles (29 km) wide and attains a depth of over a mile (6,000 feet or 1,800 meters). 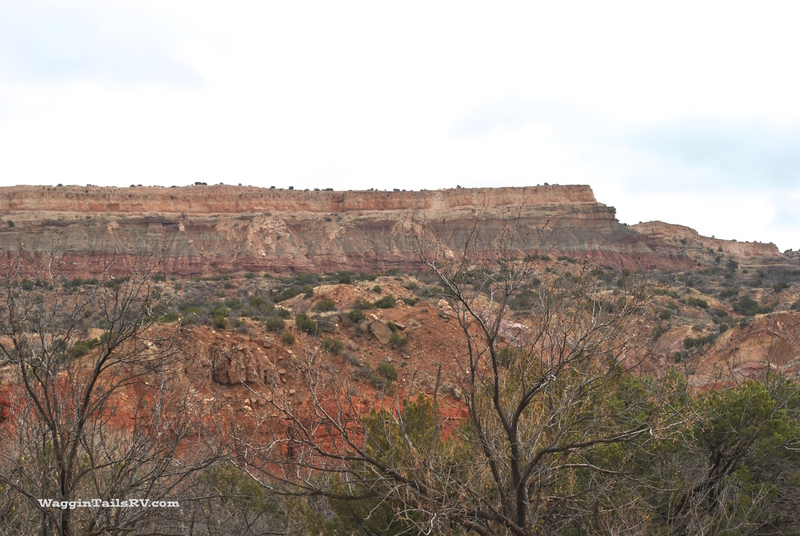 It was a cloudy, overcast day when we went to Palo Duro Canyon. I can only imagine how much more brilliant the colors are on a sunny Summer day. 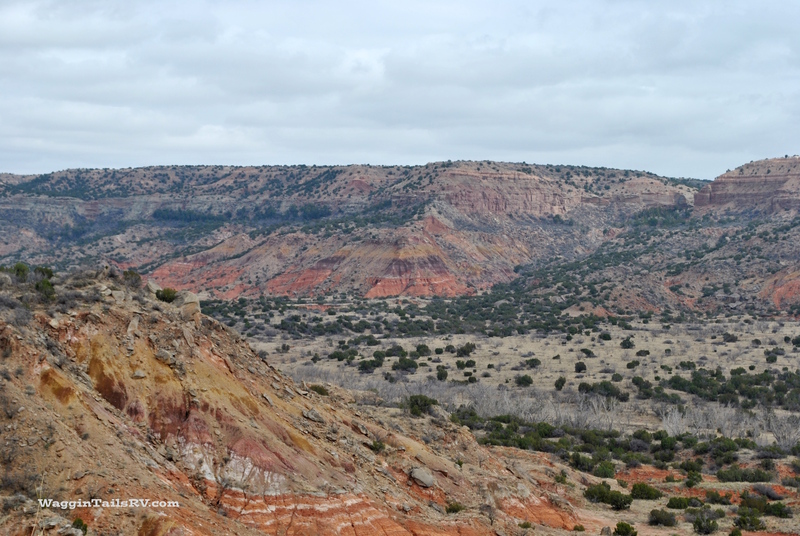 The steep sides of Palo Duro Canyon display bright colors of orange, red, brown, yellow, grey, maroon, and white rocks that represent four different geologic periods. Caves are abundant throughout the canyon. This one is approximately 40-50 feet (12 meters) in height. The white band is approximately 6 feet (1.8 meters) in height. I zoomed in to take a peak inside and and found some hikers who were taking a break from their hike around the park. Drought tolerant natural vegetation such as prickly pear, yucca, mesquite, and juniper can be found in the canyon. Another view of the colorful strata in the canyon. A one final view. Hope you enjoyed the short tour. 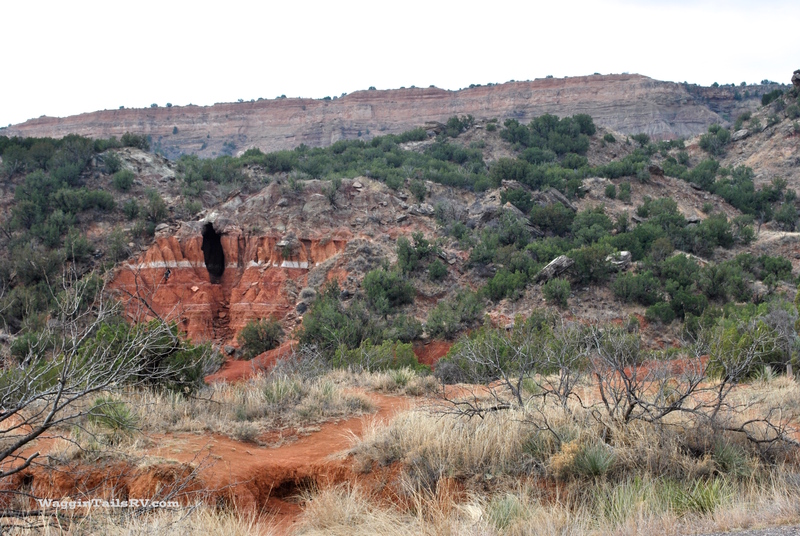 This entry was posted in Photography, Texas and tagged Palo Duro Canyon, Photo101, Texas State Historical Association. Bookmark the permalink. Love the striated colours in that last picture! Thanks Catherine. We were leaving the park and my wife said we needed to go back to get that photo. Very beautiful and interesting photos, also the tour. Thanks for the tour Jerry!